I was standing outside of a gallery that was exhibiting some of my work. The atmosphere inside felt awkward. This was a different crowd that seemed to not click with who I was for some reason- a sentiment that would prove wrong later as I learned that one of my paintings sold. Which lately says more about my regular crowd. This huge billboard in its parking lot pulled my attention. 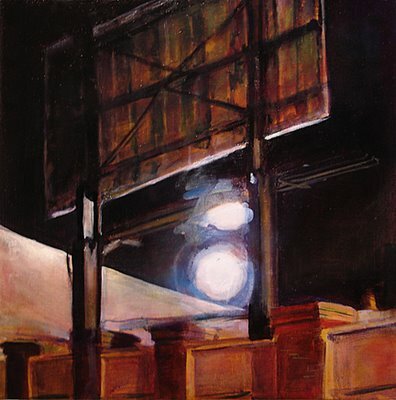 I was intrigued by the large factory light glaring almost loudly toward me and how it affected this billboard and its sharp angles looming over us. I laughed a little telling my self that I was missing what the billboard was advertising but I was listening to its very structure that made it so.